Given a rock star welcome by a decidedly eclectic audience, Bob Downe shimmied onto stage in all his camp, synthetic glory looking as young and gloriously cheesy as ever. 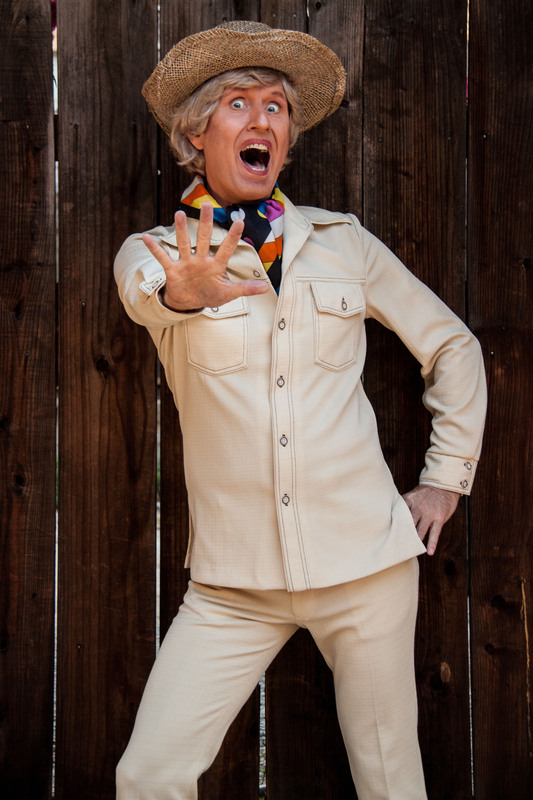 The self-styled Prince of Polyester has been flashing his dazzling pearly whites at audiences for decades now. Over the years, Bob (the sublimely funny alter ego of Mark Trevorrow) has become as iconic a comic creation as Dame Edna, yet despite the passing of time his act feels as fresh and funny as ever. But Bob is here to tell you that all this time he has been living a lie. His latest show Bob, Sweat and Tears revolves around the shock revelation that Bob is actually straight – something he has discovered with the help of a therapist. So it’s goodbye to songs like “I Am What I Am” and “Two Little Boys” (“too gay”) and hello to a newly manned-up Bob, sitting with legs splayed rather than crossed. As you might imagine Bob’s idea of straight wouldn’t cut it with too many macho blokes. His dress sense remains unaltered for starters. He opens the show in cream safari suit, neckerchief and white shoes plus trademark platinum wig, then changes into a natty, striped three-piece suit for the second act. Forever on the prowl, pulling off jaunty little moves that wouldn’t look out of place on Thunderbirds, his snappy sense of humour remains as mischievous as ever too, laced with topical barbs (Sydney’s new liquor lockout laws, Rolf Harris etc). His patter in Bob, Sweat and Tears is genuinely funny as are his send-ups of a wonderful selection of 30-plus pop and rock classics from the 1960s and 70s including “Leader of the Gang”, “Sweet Caroline”, “Spinning Wheel” and “24 Hours from Tulsa” (or Lithgow). What’s more, he can really sing. He is joined by a series of guests including Gretel Killeen as Mona Loud, the mother of Bob’s love child Cory Bernardi over whom they are fighting a custody battle (neither want him). With a fag hanging out of the corner of her mouth and a bored demeanour, Killeen is extremely funny in one of the highlights of the evening. There are also appearances by drag queen Cindy Pastel (aka Ritchie Finger), Jane Markey as Bob’s mum Ida Downe and Shauna Jensen. Performing in Sydney as part of the Mardi Gras, Bob was backed by a three-piece band called The Full Catastrophe – John Thorn (keyboards), Sam Leske (guitar) and Holly Thomas (drums). ­The first act rocketed past but mid-way into the second act, the show lost a little momentum and started to feel over extended. I could happily have done without the sketch with Bob’s mother Ida, for example, and I can’t help feeling that it would have worked better without an interval. A few cuts would sharpen the show, sending us home on a wave of hilarity rather than feeling that we’ve come down from the ride before it was quite over. Heaps of fun, nonetheless. Bob, Sweat and Tears plays at the Arts Theatre, Adelaide as part of the Adelaide Fringe, March 5 – 15, and at Melbourne’s Athenaeum Theatre, March 28 – April 20.